Almost all of us have carpets in our living rooms. With all the activity that goes on in and around the living room, it is bound to stain at one time. You may take all the precaution that you may need to protect your carpet by avoiding accidents and many other things so as to retain its beautiful look but at times, a mishap might occur without anyone’s intention. Some stains come as a result of Kool-Aid spills, drops of blood or at times from your pet when it feels it cannot hold anymore. In such instances, what do you do? There are many ways through which you could remove carpet stains. It is beneficial if you are educated to with plenty of methods that have been tried and worked out perfectly. If these stains are not treated appropriately, they would lead to further damage of your carpet. Here are some of the best ways to treat it. • First of all, blot the stain gently with a white dry towel. Do not rub the stain since it might make it harder to remove it entirely and lead to saturation of that carpet pad. • Then, mix Dawn dish soap, white vinegar and water, and put in a small spray bottle. One tbsp. of Dawn dish soap, quarter cup of vinegar and then fill it with water. Spray the stained area and leave it for 5-10 minutes as it soaks. Afterwards, continue blotting with the dry towel until the stain is removed. • If the stain becomes tough to remove, you can use the vinegar spritz method but only after you use the above method. • Always make sure you try out a portion of your carpet for any reaction. There are other products that may be of help when combating carpet stains. They include RESOLVE carpet cleaners, BISSELL Cleaning formulas as well as OxiClean. This is a challenge that pet owners come through every single day. Cleaning up the mess of their precious pet could be frustrating let alone disgusting. The good thing is that there are methods that could take care of the stain and get rid of the bad odor. Below are some tips. • The first thing would be to clean up the mess. If it is dry and with debris, pick it up using a pair of gloves and dispose it. If wet, use the blot method so as to soak up that wetness. Make sure not to smear or rub it. Repeat blotting until the carpet seems dry when touching. • To get rid of the bad odor and the spot, you may require using several tactics. One of them is the use of white vinegar or white wine. Mix a quarter cup full of vinegar and a quarter liter of warm water then spritz directly to that spot. Let it soak for a few minutes then blot the area until the stain is gone. • An alternative to the white vinegar would be a stain removing laundry detergent. • First dry the spot by blotting with a clean white towel. If the spillage was a lot, change the towels whenever they get soaked to avoid spreading the stain. • Mix vinegar, a gentle, non-bleach cleaner and water. Using the spritzer method, remove the stain. • There are other carpets thus would remove the stain with just water and bleach. By simply mixing a quarter cup or a full cup of bleach and one quarter of water, soak it on the carpet blot, rinse using warm water until it disappears. • There are certain stores such as Wal-Mart and other supply stores that sell cleaners for this kind of stain. • At all times, perform a test of the cleaners on a small patch to ensure no damage will be done. 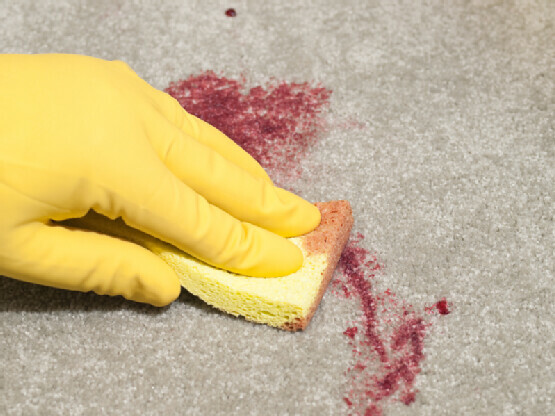 Many people dread cleaning up blood stains due to certain dreaded occurrences. Even so, it is not as bad as it seems. You will require treating the stain effectively and fast, just like any other stain. There are many ways to remove blood stains. Be assured that as you perform this procedure, the stain will be removed effectively. • The first tip is that, as opposed to the other removal procedures, when removing blood stains, use cold water. This is because blood clots with heat. Cold water will ensure the blood will not permeate in the carpet fibers. • Mix two tsp. of grease-removing liquid dish detergent and cold water. With the help of a spritzer bottle, spray the stain. Generously moisten the carpet until fully soaked, then with the help of a paper towel or dry cloth, blot the spot until the blood is soaked on the cloth. Repeat this until the stain is fully gone. • You could also use OxiClean as it is bleach free and oxygenates the carpet stains thus is idyllic for blood stains. OxiClean requires warm water to mix but for this case, use cold water and mix well. Then repeat the above procedure. • You will require being persistent and patient in this procedure. After a few tries, you carpet will be good again. Ink stains are some of the most common stains that occur. You may take every precaution you want to but you never know when the ink will spill on the carpet. Sometimes, you may end up destroying your carpet. However, with the improved technology and a lot of trial and error, new ways to remove this nuisance have been developed. There are new products that can do this job in a flash. Below is the procedure to do this. • Using a clean cloth, preferably white, dampen it in isopropyl alcohol, highly concentrated if possible, dab it in the stained area. Do not rub or scrub that area as the ink might spread. Let it stay for a few minutes and using a moisture friendly vacuum, remove the surplus moisture. Repeat this procedure until the stain disappears. • In place of the alcohol, you could use some types of nail polish removers, hairspray, white vinegar or wine. • When using these chemicals, rinse the area with clean water, then vacuum or blot until it is dry. • Before using any of the chemicals, administer a patch test to ensure the chemicals do not react on the carpet. There are many stain-removing solutions available. Some are even formulated specifically for stain removals on certain carpets. Be sure to choose one that is pocket friendly to your needs. You can also research for home remedies to remove carpet stains. Do not let that stain ruin your carpet when you can do something about it.